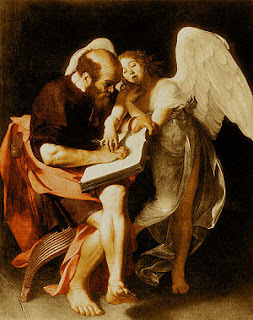 Caravaggio: St. Matthew and the Angel. Wikipedia. The Vatican really is in a frenzy to blame everyone else for its institutional failings, as Wonkette points out. Yes: Freemasons, Jews, and Gays. What's next: blaming seductive children? His comments were that there are youngsters who want to be abused, and he compared that abuse to homosexuality, describing them both as prejudicial to society. He said that on occasions the abuse happened because the there are children who consent to it. ‘There are 13 year old adolescents who are under age and who are perfectly in agreement with, and what’s more wanting it, and if you are careless they will even provoke you’, he said.